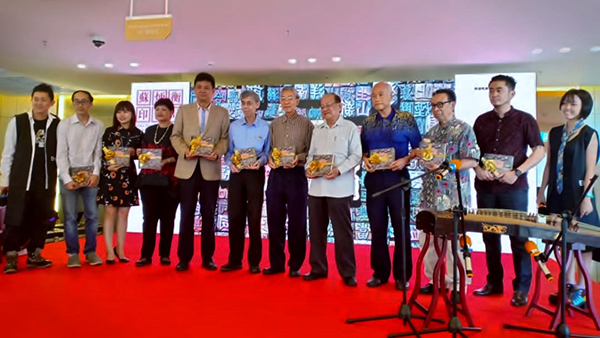 The book, Soo Peng Hang Press – Moveable Type Printing, which documents the Soo family’s heritage as the last moveable type printing press in Johor Bahru, was launched in a simple ceremony, recently. 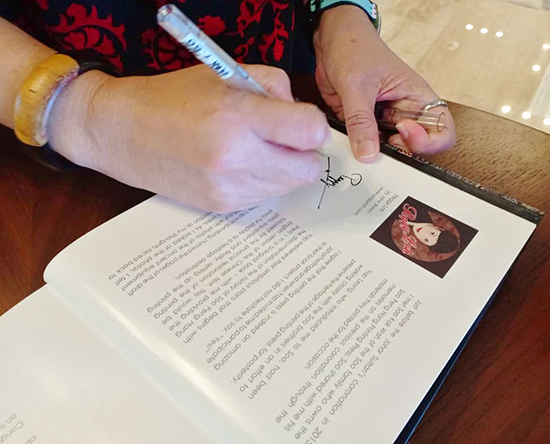 It was indeed a proud moment for the Soo family when this book, collaboration between the Earth Heart team led by Yap Leong, supported by Think City Johor Bahru and other sponsors, was completed as the first part of a major conservation project. With Yap as the team leader, the book concept and Chinese text was by Low Shi Jian, who doubled up as photographer and videographer. Wong Kha Mern and See Ca Dai worked together on the book layout and design while the main task for Chong Yii Ern was to translate the Chinese text into English. It was my privilege to work with this team to rewrite the raw English translation into proper English and prepared the text for a bi-lingual publication. When Yap invited me to participate and to write a Foreword, I was happy to do so as this ancient printing press was an integral part of JB’s culture and heritage. I’m familiar with this old printing company and it was back in 2015, just before the Johor Sultan’s coronation when Yap introduced me to Soo Kok Wah, the seventh son of Soo Peng Hang, to reminisce about his Coronation Memories. Since July 2016, Yap and his team worked closely with the Soo brothers and did their research in an effort to preserve the heritage of this ancient printing press. Yap has ambitious plans for this project which begins with the documentation of the history of Soo Peng Hang Press in a bi-lingual book and this will be followed by the physical restoration of the printing press equipment and finally, the setting up the printing press for display as a heritage institution. When I looked at the draft document for the book, I felt a strange connection as my thoughts raced back to my dad. This was because my dad told me that his first job was as a typesetter with a printing press! My dad, who grew up in the Boys’ Home of Elim Gospel Hall in Ipoh, Perak, said the missionary, George Wilson, did not like older boys to be idle so right after he completed his studies, dad went and found himself a job with a printing press. I can vividly recall the way dad described how he had to manually pick up the types or alphabets to compose the words and sentences in reverse to prepare the plate for printing. It was uncanny that before Soo Peng Hang opened his business in JB, he also worked for a printer in Ipoh so I guess my dad probably worked for this same printer but in later years! On 31st December 2006, the Soo Peng Hang Press, a company that was named after its founder, ended its operations because it could no longer compete with the advancing technologies in printing. Born in Guangdong, China, in 1896, Soo acquired his printing skills from training with master printers in China. In 1924, at age 28, he left Hong Kong for Singapore. It was always a struggle for new arrivals or sin khek and it was difficult to find a job without a friend’s introduction or reference. Finally, with his savings almost depleted, Soo stayed alive only by drinking water. After a very challenging time, he finally found a job with the Nanyang Siang Pau newspapers. He then worked for Guangming Printing Press in Ipoh before returning to JB to work in a printing press which was located at Jalan Tan Hiok Nee. Later, when the owner of this printing press wanted to give up his business, he discussed it with Soo and decided to sell the entire business to him at the cost of 1000 Yuan. In 1930, the Soo Peng Hang Press was one of the earliest printing presses here before World War II. The business was relocated three times, from No.9 Jalan Ibrahim (present-day OCBC Bank) to No. 4 Jalan Tangga Duke (present-day Foh Chong Building) and finally at No. 48 Jalan Wong Ah Fook. After the JB Tiong Hua Association published an interview with Soo Kok Wah about the family’s printing press, representatives from the Beijing Museum contacted him to express their interest to visit their premises here. As this project is progressing to its next stage, which is to restore their former business premises, he told the Beijing Museum representatives that a visit may be possible in a few years’ time. They are now seeking partnerships to set up the heritage gallery dubbed the Soo Peng Hang Moveable Type Printing Experience Hall, where locals and tourists, students and researchers, may have interesting and informative learning experiences. Among the precious artifacts they have preserved are rare items like the menu printed for the landmark Hwa Mui Restaurant, which was then a popular bar. I was amused to read this menu which offered a variety of Whiskey, Port and Gin! Soo Peng Hang Press also printed calendars and gave them as gifts annually. 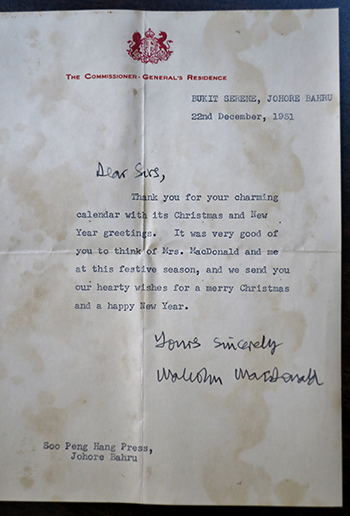 In December 1951, they received a letter from then British Commissioner General in Southeast Asia, Malcolm MacDonald, who expressed his appreciation for their calendar. The original typewritten note showed his residential address at Bukit Serene Johore Bahru [Ancient spelling for Johor Bahru!] with the signature of the Commissioner General. This ancient printing press has much heritage value because it was established in multi-cultural Malaysia and had the unique capability to print materials not only in English and Chinese but also in Malay, Jawi and Tamil languages. Soo Peng Hang Press was then the most important printing press in JB which printed many documents as a legacy to many local establishments here and it also witnessed the development of Johor as a state and the advancement of modern printing techniques.